Why the 2013 Mercedes-Benz GLK? The diesel option was the #1 reason I looked at the vehicule and the deciding point to go with it. At over 200 miles per day to communte, I needed the mileage numbers and in Quebec, diesel is less expensive than regular gas and way less than premium. Even coming from a 4x4 (Explorer Sportrac) I like the driving position and don't feel like I'm sitting on the road. 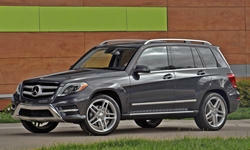 Why Not the 2013 Mercedes-Benz GLK? We are a couple with no kids and we rarely have visitors so the cramped rear seating is not a problem. Someone with teenage kids will want to seriously reconsider before getting a GLK. I know my Mom would not appreciate the ingress/egress ease as she has some limited mobility.